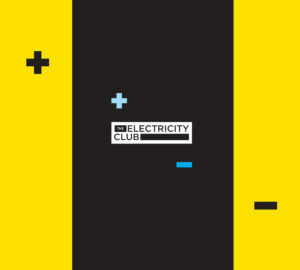 VILE ELECTRODES headlined The Electricity Club’s first live event in Autumn 2011. But following the release of their debut ‘Vile Electrodes’ EP featuring brilliantly quirky electronic pop such as ‘Play With Fire’, ‘Headlong’ and the magnificent splendour of ‘My Sanctuary’, they remained silent for most of 2012 as they wrote and recorded more material. Then as the year drew to a close, they premiered their first song from the sessions ‘The Last Time’. NOT a cover of The Rolling Stones track which was subsequently ripped off by The Verve in its Andrew Loog Oldham lounge arrangement, singer Anais Neon described it as “our aural Ferrero Rocher and / or L’Oreal. Hope you like!”. Invited to support OMD’s upcoming tour of Germany in May following Andy McCluskey spotting the band while perusing The Electricity Club, they will also be opening for JOHN FOXX & THE MATHS at Brighton Concorde 2 in June. Not only that, VILE ELECTRODES will be releasing a new EP ‘Re-Emerge’ to coincide with the tour and finally, their long awaited debut album ‘The Future Through A Lens’ in June which includes fan favourites ‘Proximity’, ‘Feed Your Addiction’ and ‘Deep Red’. Martin, what was your first keyboard or synth? Martin: When I was about 14, my mum bought me a Casio PT20, which was a tiny keyboard just one step up from the old VL-Tone… and I wrote songs on it. I’d always known I had song-writing ability and, as soon I had this PT20, I was able to get on with it. When I was 16 the girl I was going out with had left school to get a job as a dental assistant. With pretty much her first pay packet, she bought me a Roland SH101 for my birthday! It was £185 from Vroom in Watford – where I ended up living above a few years later. So that was it! PT20, SH101 and, a few months later, I picked up an MC202, which is a little sequencer that goes with the SH101. It was only £50, which is unbelievable now. I used to write these little tunes (with no drums on them!) and record them onto cassette. It all started from there. What types of synths do you like? Martin: One of my real loves is string synthesizers. They’re not like regular synthesizers, in that they’re an older technology and quite primitive. None of the string sounds are that authentic by today’s standards. The manufacturers like Roland, Yamaha, ARP and Moog tried to make them sound like orchestras, so they put chorus units inside them to thicken their sound, and make them sound as big and as lush as possible. It’s the sound of a certain era of music for me. It’s that GARY NUMAN sound that sits over the Moog bass, it’s the sound of ULTRAVOX, it’s the sound of early OMD. It’s even the sound of indie acts like ECHO & THE BUNNYMEN and THE ICICLE WORKS. So I have a whole load of them and just fall into their swirly loveliness! Martin: For ‘Deep Red’, I set up some drones and held down the same key on about three different string synths and it creates this amazing atmosphere. There’s a Yamaha SK20, which plays the foreboding sound, and the higher parts are played on a Moog Opus 3. The thing about the Opus 3 is that it’s got a resonant filter, which is unusual for a string synth. With a chorus added on that, it sounds really spooky. There’s actually two melody lines, the first is played on a Yamaha CS15 and sounds like a filtered dying cat, for want of a better description, while the second one with the higher strings is played on the Moog. Your favourite instrument appears to be the Korg MS20? It must be a pain to use live? 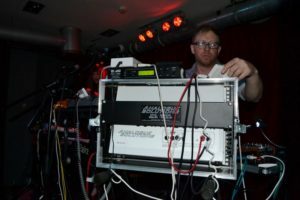 Martin: The worst thing about using the MS20 live is lugging the flight case around. It’s actually pretty simple to use! It’s got big dials so it does look a bit like it’s controlling radar or something, but it means it’s easy to know where you are with it. It’s also really reliable, unlike some of the other gear that we have used in the past; it stays in tune and the filters are really strong. I know it really well so I can do what I want to do on it. Anais, your set-up is a bit simpler, what do you use? I have inherited a love of synths from Martin, but I’m not a true synth geek and I don’t know all the subtle differences the way Martin does. For me it’s a case of “that one has a really lovely sound, we have to have more of that!”. Martin: She does that a lot with the Juno 6, which is why a lot of our songs have got Juno arpeggios in them. ‘Proximity’ prominently features it. Anais: Martin was in the studio and just started off a simple drum loop and kicked off an arpeggio sequence on the Juno and I went “oh my god”… half an hour later, ‘Proximity’ was written! It’s such a beautiful sounding bit of kit. We’ve actually decided to take it to Germany with us! Martin: It’s got very basic sounds, but what it does is quite unique. It has this ensemble, as soon as you add vibrato it starts to sound great, a real OMD vibe to it like ‘Almost’. Because it’s so simple, it’s a fantastic instrument to use live; four sounds but really strong. We use it a lot for top melody lines. It’s small for a string synth so it’s more practical. It’s got such a richness, very 1978-79! I think THE CURE used one on ‘The Funeral Party’ as well as an ARP Quartet but not many bands have used it, that’s one of the reasons why I like it as well. Martin: Our Mopho was in the first batch that came into the UK, and I was very lucky to get it. I can thank The Arts Council here, because I got it as part of their ‘Take It Away’ scheme so it didn’t cost me a penny up front and I’ve paid for it since on interest free credit. It’s a modern take on the Sequential Circuits Pro-One, which is a classic analogue monosynth that DEPECHE MODE and HOWARD JONES played. The Mopho is a combination of that and the Moog Source, which was the first monosynth that had memories. Obviously, it really helps for playing live to switch from one patch to another. But it’s quite sturdy and the sounds are more contemporary than the SH101 for example. 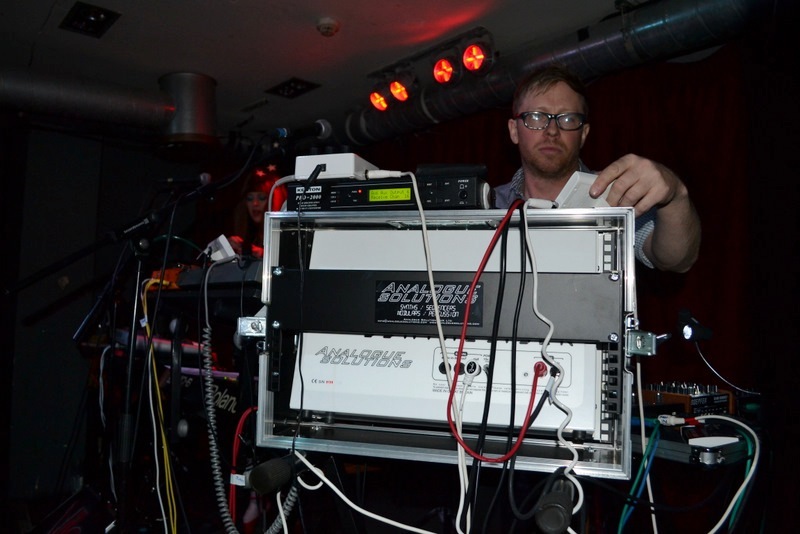 I think LITTLE BOOTS’ keyboard player Chris Kemsley was the first person in the UK to get one. It’s kind of old school vintage synth in one way but it’s got a modern aesthetic as well. It’s very muscley! That’s the thing for me, VILE ELECTRODES music isn’t stuck in the 80s but neither is it completely contemporary, it’s somewhere between the two. And hopefully as a result, doesn’t date too badly! We’ve decided not to take the Mopho to Germany with us, though. We’re taking our new Analogue Solutions Leipzig SK instead! How do you feel about being invited to support OMD and JOHN FOXX? Anais: It’s a fabulous opportunity, and a genuine surprise! It may sound like a fawning cliché to say it, but they are honestly some of our favourite musicians, and naturally huge influences on us. I could be wrong but, particularly for OMD, I think fan opinion played a role in our being offered the slot, as there were lots of people talking about us in OMD forums, and we’ve had a wonderful show of support since we told people. We keep saying that we feel so lucky, and there is an element of luck, as there are so many great and deserving bands out there. But at the same time we do work really hard at building relationships with the people who support us, and they in turn work hard to tell people about our music. Which is good, as we’re rather rubbish at that part! Modesty aside, it’s a kind of validation, too, for what we do creatively. We are just who we are, and we haven’t tried to follow any particular format or formula, or create a special mystique. And we don’t have some grand plan or intended career trajectory. We just make pop music. We use electronic instruments. But what we do doesn’t sound like contemporary pop, but neither does it particularly sound like classic synthpop, or dance-pop, or minimal wave, or post-punk or whatever. Our songs really cross a whole load of different styles, and I think people recognize that we’re not easy to pigeonhole, and that we have something a bit different to offer as a result. Martin: OMD were the first band I ever saw live, the band I spent my teenage years obsessing about and collecting everything I could of theirs. So it’s amazing!! But it still hasn’t really sunk in. It’s so exciting, but also quite daunting. Most small bands in the UK don’t get to play to more than about 50 people on a regular basis, so it’s big step up, and we’ve got a lot of work still to do to feel like we’re representing what we do properly on a big stage. You’re known for your big live set-ups. Are you reducing what equipment you’re taking to Germany for the OMD tour? It’s very important for us, when performing, to do as much as we can live, and you can’t do that for our songs with just a couple of synths and a drum machine. Most of our tracks have been recorded live in the studio, with everything running and being played (hopefully) in sync together. This includes some very old and very fragile pieces of equipment, some of which we definitely wouldn’t risk taking on the road, as we could never afford to replace them if something happened to them! As a consequence, our recorded sound can be difficult to reproduce on stage. If we think something is really integral to a particular track, then we do try to recreate it but, to us, playing live should be a unique experience each night. It isn’t the same as being in the studio – it should be a performance! Martin: Not much of what we use has memories, and we purposefully don’t make detailed notes, preferring to go on how things sound rather than what the settings are supposed to be. And things will go wrong – they always do! Expect confused arm-flinging, puzzled looks and raised eyebrows… it’s part of the fun! Anais: … excitement and enthusiasm really. At least it is now! I’d never been in a band before VILE ELECTRODES, and both song-writing and performing were totally alien to me. When we first started out I needed prescribed structures and sounds. It was so hard for me to be on the stage in the first place that, if something was different, it totally threw me off course. I forbade Martin from making any weird unexpected noises, as it made me think I’d missed my cue or something! But I’m over that now. Expect weird noises galore. How are you finding playing live now that you’ve streamlined to just the two of you? Anais: VILE ELECTRODES started out as two-piece, but I was such a nervous performer that it was all I could do to stand behind a microphone and remember my lyrics. So we invited some good friends to join the band, in part as moral support for me, but also to fill the gaps where Martin didn’t have enough arms to do everything. As the Vile schedule got busier, the others felt they weren’t able to commit the time and energy that the band was starting to require, so we went back to being a two-piece. By that time my nerves had mostly subsided, anyway, and I was able to take on more roles – and more equipment! Nowadays, Martin complains that he hasn’t got enough to do on stage! In short, being a two-piece is brilliant and has totally changed how we’re able to work together and make creative decisions. Until recently Anais, you were moonlighting as Gillian Gilbert for NEW ORDER tribute band RE:ORDER? Anais: We’ve just done our last ever RE:ORDER gig (until the Re:Union, of course! ); basically, when VILE ELECTRODES were just starting out, I had a call from Will (RE:ORDER’s Barney, and a longtime friend of mine) to say that they were losing their Gillian, and did I maybe happen to know someone that could maybe play a little bit of keyboards and maybe a little bit of guitar hint hint… it seemed like a good chance to get a bit of on-stage experience where I wasn’t going to be the centre of attention, so I signed up. It’s been great fun, and we’ve played some brilliant venues, and it really helped with my confidence building as a performer. I’ll miss it, but I think I’ve got plenty of Vile activities to be focusing on at the moment!